My good friend is currently obsessed with the new TV show Outlander. She’s also been taken with some of the heroine’s knitwear so she asked me if I would help her design and make the capelet that is featured in the show. She needed to purchase some wool for the project and I thought it would be a good excuse to visit one of the local yarn shops that I had never visited before. 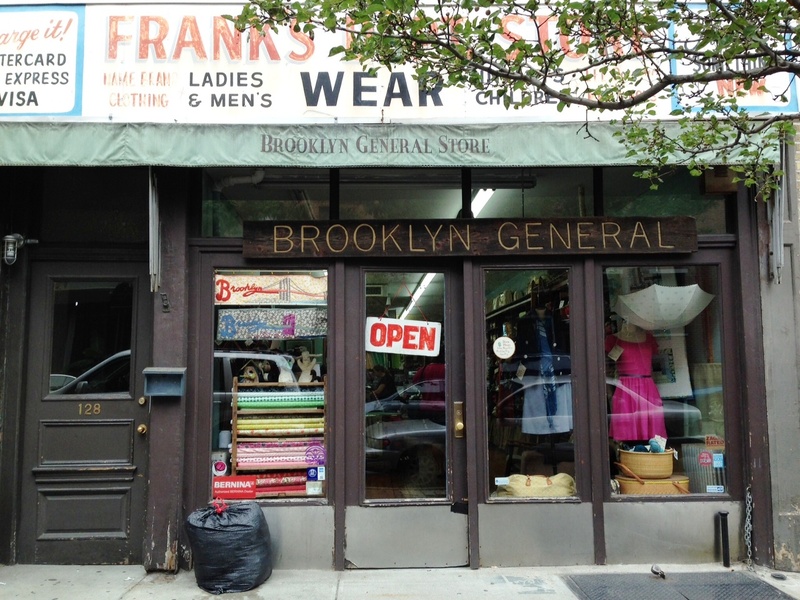 Being a Queens girl I don’t get to Brooklyn very often, but I had heard that Brooklyn General Store was a wonderful yarn/sewing shop and I had been meaning to visit it for a while. 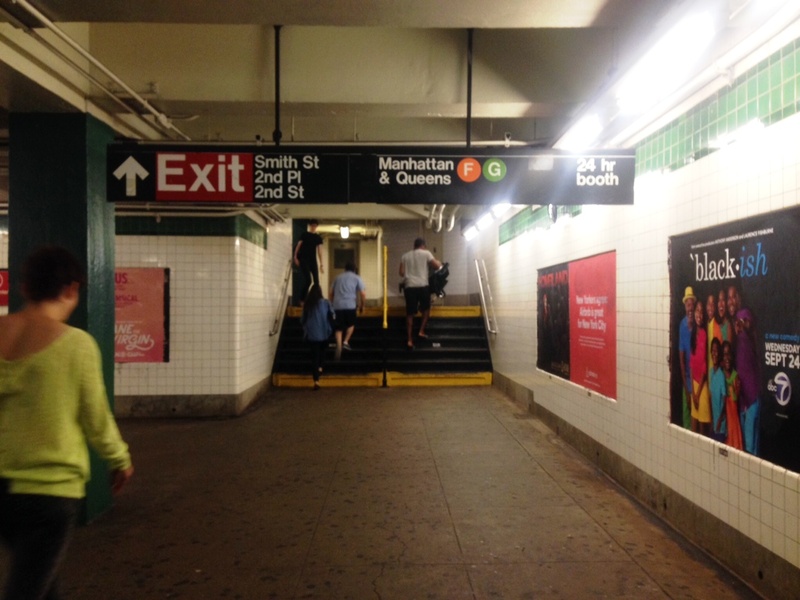 I took the F train to the Caroll Street stop. It lets out onto Smith Street, which is a busy street filled with shops and restaurants. Lunch was in order. 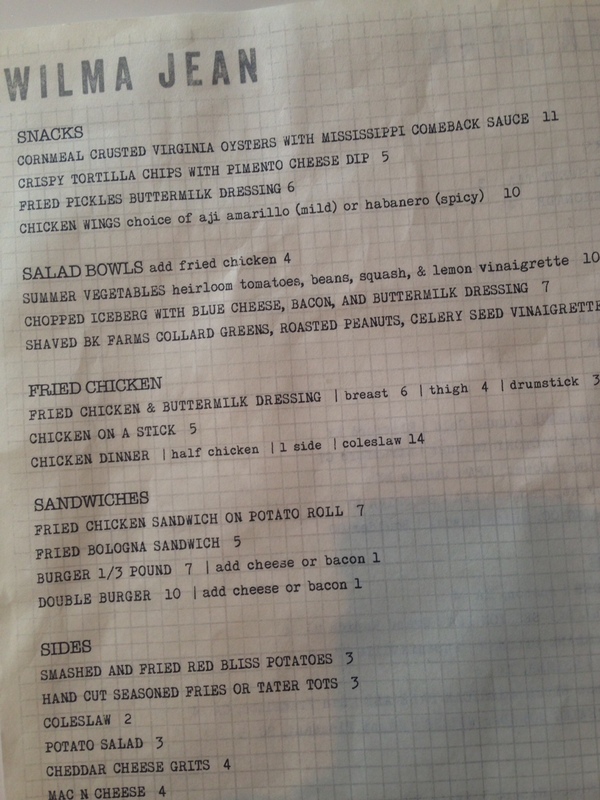 We settled on eating at Wilma Jean, one of those chef-y Brooklyn places that specializes in fried chicken. The food was pretty great. Juicy fresh chicken, tater tots (!!) and a gorgeous, deep red, vinegary house made ketchup. The cornbread was pretty good, but it was a bit dry and lacked a little flavor, though the salted molasses butter helped. I had a root beer. I haven’t drunk a root beer in ages. It was a good thing. After our late lunch we strolled west, down the tree lined streets filled with brownstones. I do love a brownstone. Even though it’s brimming with tight trousered hipsters, artisan cheese and baby carriages, Brooklyn is also full of charming neighborhoods. I have to give it that. Brooklyn General is a really cute shop, living up to its too-cool-for-school Brooklyn reputation. Sadly that reputation extends to the staff there. I’ve worked in retail for over a decade, so my standards of customer service are rather high, admittedly. The women did greet us, but it was a bit chilly and perfunctory. At one point while browsing we were asked if we needed assistance, so that was encouraging. When we were ready to pay for our purchases, we stood at the counter for a minute or so while the chatting women behind it ate potato chips and finished their conversation before acknowledge our presence. Not exactly the way to treat paying customers. 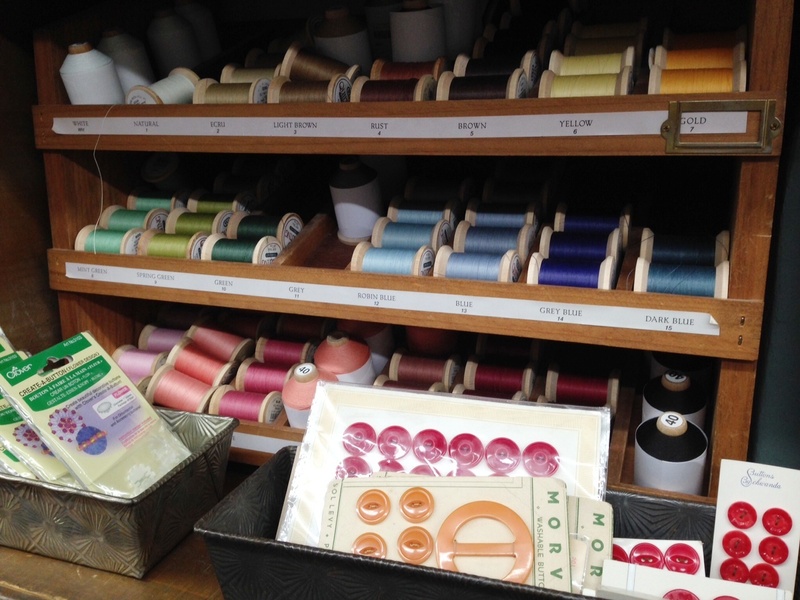 So while the shop has charm, and a decent selection of fabrics and wool, it’s certainly not worth the trip to Brooklyn, at least for me. 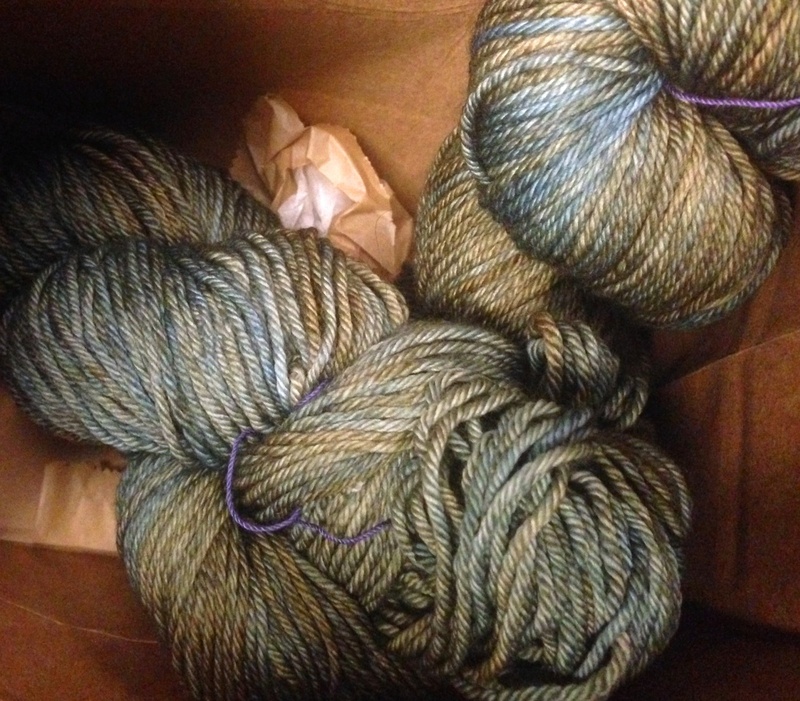 I did get two delicious skeins of Madeline Tosh DK there. I can’t wait to start knitting that up! On my way to the train home, I stopped in at Smith Canteen for an espresso. Such a cute coffee shop. I’m a complete ninny though, and left my bag of wool there. I didn’t even notice it was gone until I got home, and at first, I thought it had become a sacrifice to ye F train gods. I was about to resign myself to disappointment when I remembered the coffee shop and me setting it up on the shelf above where I sat and sipped my coffee. I tried calling the shop, but wasn’t able to get through to anyone, so I emailed them. They replied pretty quickly and said they had found my wool. I made the trek back the next day and retrieved it. Thank you Smith Canteen! What an adventure! I’m dying to see the capelet you design. So lucky you didn’t lose the wool forever.